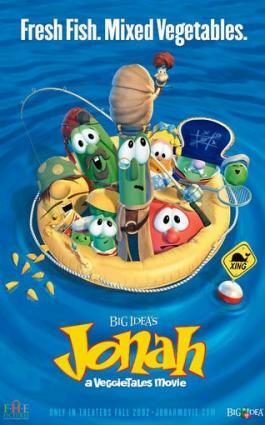 Jonah: A Veggie Tales Movie is the first full-length, 3-D animated feature family movies from Big Idea studios. It doesn't disappoint, offering the high-quality "Sunday morning values; Saturday morning fun" that Veggie Tales lovers of all ages have come to expect from Big Idea's shorter animated films. Bob the Tomato is driving all the Veggie kids, including Junior Asparagus and his dad, to the Twippo concert. It's late at night, and Bob is just a little irritated by the fact that Junior's dad isn't helping him navigate -- he's busy playing his guitar and singing with the kids. And then Laura Carrot won't stop bragging about the backstage pass to meet Twippo that she has won. While this is happening, an angry mother porcupine flattens two of the van's tires with a couple of well-aimed quills, and the group is stranded. There's a seafood restaurant nearby, and the group goes there to get help. Bob is furious with Junior's dad and refuses to accept his apology. And Junior is disgusted with Laura and tells her that it's her own fault that she lost her ticket, that she deserves to be left out for being so snotty about winning. The group is seated near the pirates. The pirates overhear Junior's conversation with Laura. They tell him that he needs a little compassion, and they tell the story of Jonah to illustrate their point. 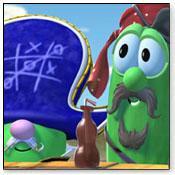 Archibald the Asparagus is Jonah, a prophet of God who travels the land of Israel delivering messages from the Lord. The people love him and follow his doings with interest. Jonah is pleased with his work ... and, truth be told, he's rather pleased with himself. One day, God tells Jonah to go to Nineveh. Jonah is horrified. The people of Ninevah are just plain bad. They lie, they steal, and they slap people with fish. They just don't know the difference between right and wrong, and they are especially mean to Jonah's people. Jonah is determined that he is not going to Nineveh. He makes arrangements to take a cruise to Tarshish, in the opposite direction of Nineveh, on the ship of the pirates who don't do anything. On the ship, Jonah meets Khalil, a Persian caterpillar who sells Persian rugs and has a penchant for listening to self-help audiotapes. He also sells Jonah merchandise, so he's enthusiastic about meeting Jonah. Jonah is so arrogant, he won't even learn how to pronounce Khalil's name properly, calling him Carlisle. When Jonah finally gets to sleep, a terrible storm blows up, and the captain comes below-decks to seek Jonah's help. Furious to discover the caterpillar on board, the captain proposes a game of Go-Fish to determine who is responsible for the storm, which the captain believes is a result of God's being very angry with someone on the ship. Jonah loses the game and admits that the ship is in danger because he is running away from God. The captain and crew throw Jonah overboard, and the storm stops abruptly. Then, as they try to rescue Jonah from the waves, a tremendous whale swallows him. In the belly of the whale, Jonah is miserable. When Khalil shows up inside a bowling ball that the pirates had shot at the whale, Jonah is even more unhappy. He is bemoaning his fate and wishing for death when a choir of angels (singing Southern Contemporary Gospel) shows up and tells him that he simply needs to ask God for a second chance. If a person is willing to admit wrongdoing and change their ways, God is willing to forgive them. So Jonah prays for forgiveness, and the whale vomits him out onto the beach. Khalil follows. Jonah's camel shows up and carries them to Nineveh. When Jonah arrives in Nineveh, he cannot get in. Until he meets the pirates who don't do anything. It seems that they won a contest and got a free tour to the Mr. Twisty's factory in Nineveh. They get Jonah into the city, but all of them are promptly arrested because one of the pirates took some snacks from a display -- he didn't realize the display was actually a sacred altar. In the arena of judgment, Jonah sees the danger they are all in: the Ninevites have an elaborate fish-slapper that will crush them if they are found guilty. At the last moment, Jonah shouts that he was not one of the thieves, because he was in the belly of the whale when the theft happened. Everything stops. The King asks Jonah if he can prove that he was in the whale, because the Ninevites worship The Great Fish. One of the king's servants sniffs Jonah and passes out ... this is the necessary proof, and the whole party are freed. Jonah delivers his message: Stop cheating, lying, and slapping people with fish, or the city will be destroyed. The Ninevites repent and beg God to give them a second chance. The story's not over, because it's not really Jonah's obedience that God wanted. He wants Jonah to learn compassion, even for his enemies. Jonah goes to the outskirts of the city and sits on a cliff to watch God destroy the wicked Ninevites. He's quite elated and eager for the carnage to begin. When it doesn't, Jonah is angry. He starts to rail at God for not wiping the evil people off the planet, and that's when Khalil lets him have it. Khalil tells Jonah that he is pathetic, and he cannot put up with his arrogance any longer. Maybe, he says, God wants to give everyone a second chance, and maybe Jonah should do the same. He tells Jonah that he is leaving, because he wanted to be big and important like Jonah, but now he sees that the world doesn't need more big, important people. It needs people who are kind and compassionate, and that is what he wants to be. The Pirates' story ends with Khalil and the camel leaving Jonah to sulk in the wilderness. As the group of kids discuss how dissatisfied with the ending of the story, Twippo arrives at the restaurant. He's lost and running late. When he learns that the group of kids is on its way to the concert, he offers them all a ride. A disappointed Laura begins to cry, and Junior offers her his ticket. Twippo is so impressed by this act of mercy that he gives the entire group backstage passes, and the movies ends with a big musical number that summarizes Jonah: A Veggie Tales Movie and points out that Jonah never really did get the lesson God was trying to teach him. As Larry the Cucumber says, "Compassion is when you want to help someone who needs help; mercy is when you give someone a second chance, even if they don't deserve it. This story is about both of them." The story of Jonah is about learning to give everyone, even your worst enemies, a chance to change. The songs in the Jonah: A Veggie Tales Movie are the typical Veggie Tales songs: simple, easy to remember, and sung by the Veggies. The exceptions are "Second Chances," the lively gospel song performed by Anointed and "Belly of the Whale," which is a great contemporary Christian piece performed by Newsboys. The other songs under the credits are part of the great Veggie Tale "Silly Song" tradition.